Ellen Sprigg is the associate director for the SCN Volunteer Program. She recently returned with the Sisters of Charity of Nazareth disaster relief team from Lee County, Alabama. The tornado outbreak of March 3, 2019, was severe. 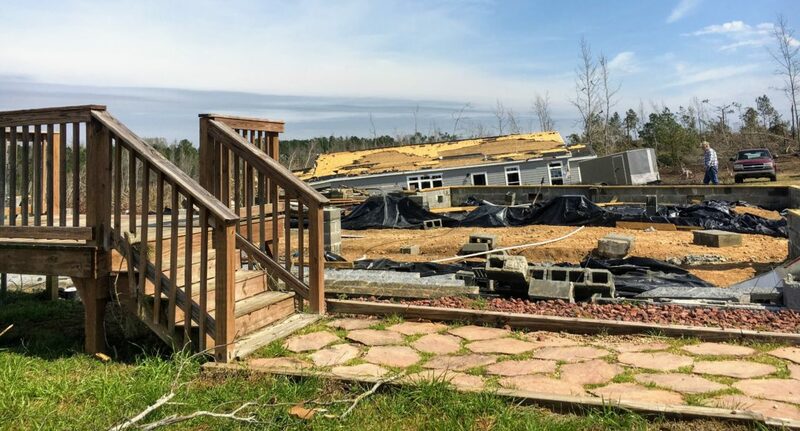 A total of 40 tornadoes touched down across the Southeast, devastating rural communities like Beauregard, Alabama. She shares this reflection. 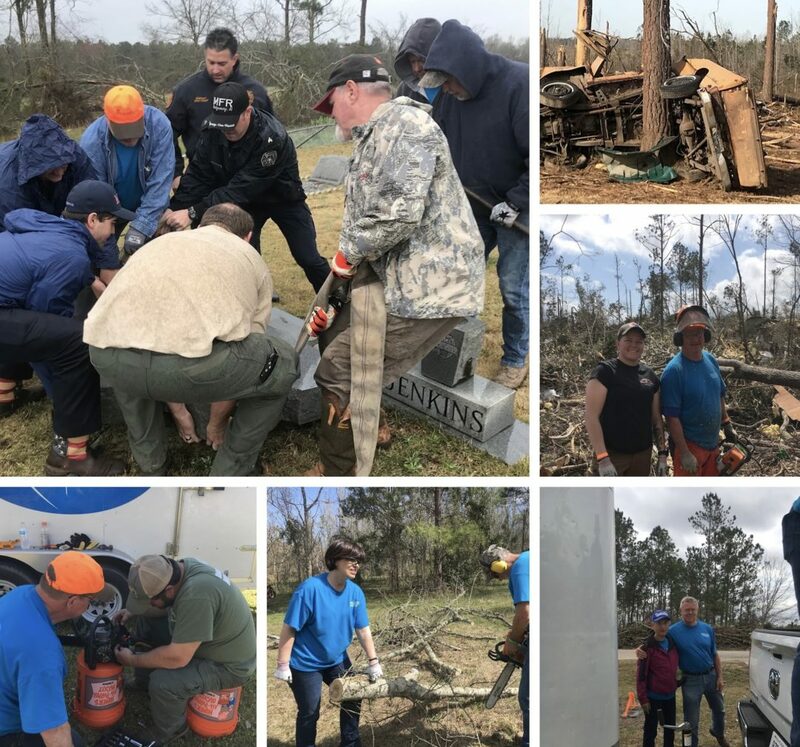 As the days drift by and I am immersed back into my daily routine, my mind and prayers are still so drawn to the people and the hardships they are facing each day from the devastation they experienced in those minutes that changed their lives on March 3, 2019, in east Alabama. 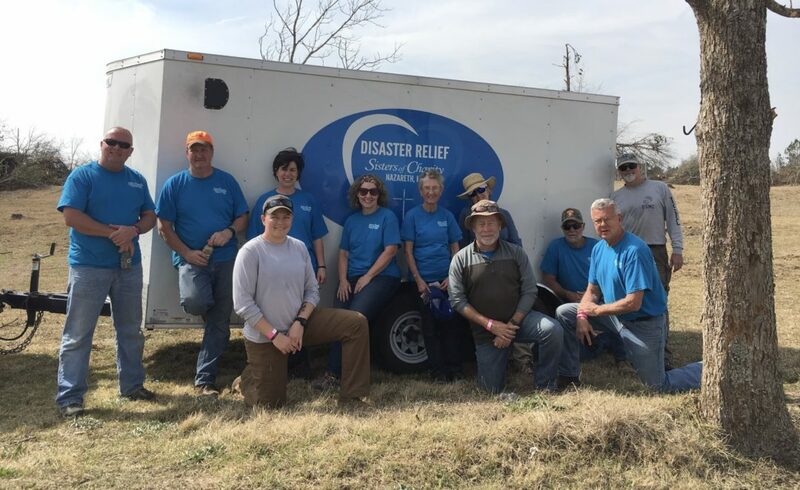 Our team of eight, spent six days responding to our call to serve and helping those affected to pick up the pieces and to help make life more “doable”. On Sunday, March 10 our team of eight met in Nazareth, Kentucky, for Mass and commissioning service. Rev. Gary Young and the beautiful blessing sung by the Sisters and the congregation never fails to help give us the strength we need for any mission. We left with no doubt that their prayers and love would be with us on the journey. Sister Luke Boiarski, director of the volunteer program, prepared us with reminders and words of wisdom and soon we were off for the seven-hour road trip to our home for the week on the campus of Auburn University, just 20 minutes away from the terrible destruction. Monday morning we were up early, eager to lend a hand wherever needed. There was a quiet calm among the group as we made the drive to the volunteer station operated by the Lee County, Alabama Emergency Management Agency. As we waited patiently and anxiously for our assigned location, we quickly began to talk with other volunteers, fire fighters, and forestry professionals. After a short safety training and collecting tools and supplies being distributed, we were off to our destination for the day. Our eyes began to see, for the first time, the power of Mother Nature and the path of destruction the storm left behind. So many trees topped and uprooted. So many homes totally destroyed or with roofs missing, cars thrown against trees, piles of debris bull dozed to the sides of the road in every direction, complete hill sides with nothing standing, a home standing in the midst of total destruction all around it; personal belongings hanging from branches and in every direction. Our mission this day was sorting through the belongings of a man whose trailer had been destroyed. He was grateful that he and his family had been spared their lives. His daughter’s home was directly behind him and was lifted off its foundation and sat down about 200 yards away. Praise God they all survived. As he relived the moments with us, it was extremely difficult for him to speak about it. We offered him many hugs and hope we were able to help ease the pain that day. Before ending our day, we followed our site leader to a small cemetery where many grave stones were overturned. It was an honor to lift the stones back to their original place for the respect to those buried there. On our drive back to our apartment, we pulled off the side of the road as 9 hearse passed us by. Once again, no words to describe the sorrow in the pit our hearts and the sadness were felt for this community. Each day our routine was to check into the volunteer site of the Emergency Management Agency to see where we could best be used for the day. We began to meet up with the same volunteers and add new friends to our work team. It was good to serve alongside so many beautiful people, giving of their time for the day or for the week. Each day had its own story and each resident we helped was so thankful. We began to notice the overwhelming stress of the homeowner as we approached each site, but as we spent time with them, ate lunch together, laughed and shared stories together, and worked alongside them, we were able to lessen their burden – which soon became the true meaning of our mission more so than the work we did. One homeowner said to us as we were departing, “thank you for making everything more doable”. Those words seem to sum up the week of our Disaster Relief Mission. We hope and pray we were able to make life more “doable” for Dan, Brad and Deanna & family, Alfred and his family, for Jimmy, for Robert and his wife, and for those we did not have the chance to meet. May God Bless this beautiful community of Beauregard and keep them strong in his love. Only the servants of Goo,with the love and cto walk in those shoes !!! !